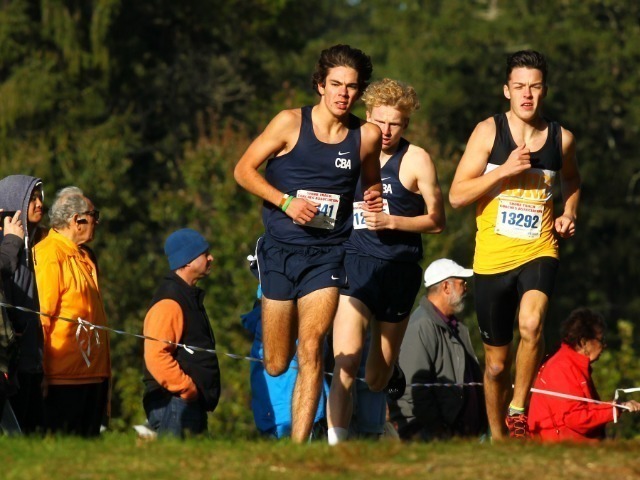 The final week of November at CBA has become synonymous with one major event: the Nike Cross Country Nationals. The CBA cross country team will be representing the Northeast region for the ninth consecutive year near Nike's headquarters in Portland, Oregon. The Colts qualified by way of the Nike Northeast Regional, winning the title for the second time in three years last weekend. The first and second place teams advance to the Nike Nationals. Seniors Tim McInerney and Luke Reid led the way at the regional race, finishing fourth and fifth respectively. Junior Shaw Powell was not far behind in seventh place. CBA won nine points over Hunterton. Now, the Colts find themselves back in Oregon, where they have finished in the top-10 in seven of the past nine years, including winning the national title in 2011. CBA was seventh in both 2017 and 2016, but head coach Sean McCafferty believes that this year's experienced team could top those finishes. "We have four kids from the team that raced last year in McInerney, Troy Hill, Reid, and Mike Morris, plus Powell who transferred in from Portland," said McCafferty. "Between those five, they have raced this course 10 times. Compared to other teams, that’s a lot." While last year's team consisted of mostly sophomore and juniors, the 2018 team has experience, which can never hurt in a major setting like the Nationals. "This trip is a whirlwind and can be overwhelming, but our seniors are really great. McInerney and Reid know exactly what to expect. They bring an incredible balance of serious preparation and fun." As someone who has run in the spotlight over the past two years, McInerney is ready to put it all on the line as a senior. The veteran of the group echoed his coach's thoughts on how the trip and the race can be daunting. "Nationals is a very overwhelming experience for someone who has not experienced it before," McInerney said. "It absolutely serves as an advantage to us that we have five guys who have raced the course before. I’ve taken the role of making sure everyone stays focused in a really exciting experience." The Colts have already captured a handful of big titles this fall, including the Shore Conference, Non-Public A State, and Meet of Champions. They are currently ranked as the top team in New Jersey and the 11th best team in the country by in the Flo50 Rankings on Milesplit.com. Saturday’s Nationals race will begin at 2:35 p.m. eastern time. CBA will be hosting a viewing party in the McKay Gym, beginning at 2:00 p.m. Bring your friends and family to cheer on the Colts! If you are watching the race from the comfort of your own home, head to the Nike Cross Nationals site (www.nxn.runnerspace.com) to stream the race. Be sure to look for the team sporting the LINCROFT singlets!